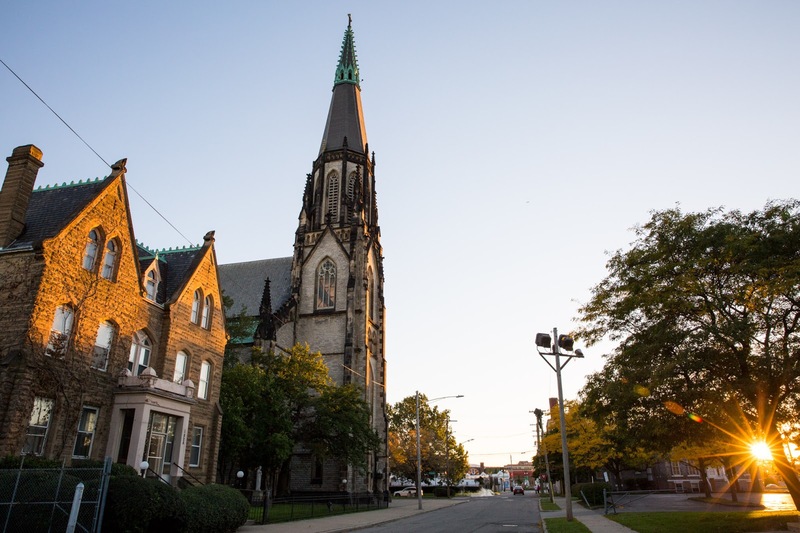 Our thanks once again to Teresa Chisholm, this time for sending in this report on the newest apostolate of the Institute of Christ the King, in the Archdiocese of Detroit. A special first Mass will with some very good music be celebrated tomorrow in the St Joseph Oratory (details in the article and in the poster below); the church has been featured many times in our photoposts for their exemplary Masses in both forms of the Roman Rite. This week the Archdiocese of Detroit officially announced that Archbishop Allen Vigneron has created a new parish at historic St. Joseph in the heart of Detroit. 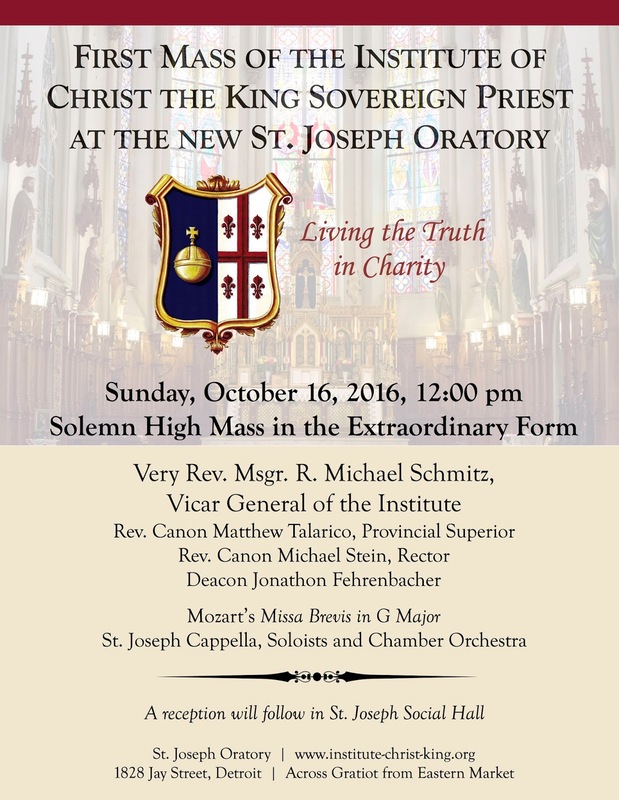 Called St. Joseph Oratory, this new parish is under the pastoral care of the Institute of Christ the King Sovereign Priest. St. Joseph Oratory is the Institute’s thirteenth church in the United States. Rev. Canon Michael Stein has been appointed rector, assisted by Deacon Jonathon Fehrenbacher. They will reside in the rectory, a stately building dating to 1896 which has not been home to a priest in over ten years, since St. Joseph was clustered in 2004 and then merged in 2013 with two historic Polish churches in Detroit, St. Josaphat and Sweetest Heart of Mary. Rev. 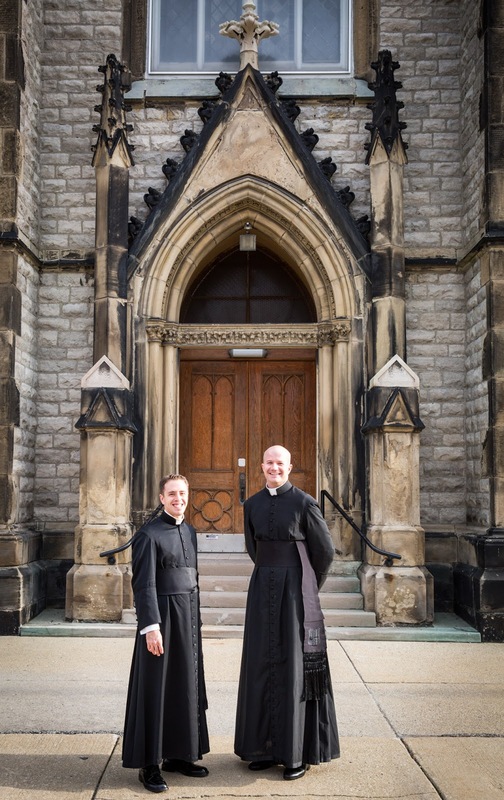 Canon Michael Stein and Deacon Jonathon Fehrenbacher arrived in Detroit on October 11. The festive First Mass of the Institute is Sunday, October 16 at noon, celebrated by the Very Rev. Msgr. R. Michael Schmitz, vicar general of the Institute. Also present will be Rev. Canon Matthew Talarico, the provincial superior. St. Joseph Cappella, Soloists and Chamber Orchestra will present Mozart’s Missa Brevis in G major and Jubilate Deo, Bruckner’s Locus Iste, and the Gregorian chant propers. A celebration to welcome the Institute to Detroit will follow in the hall. 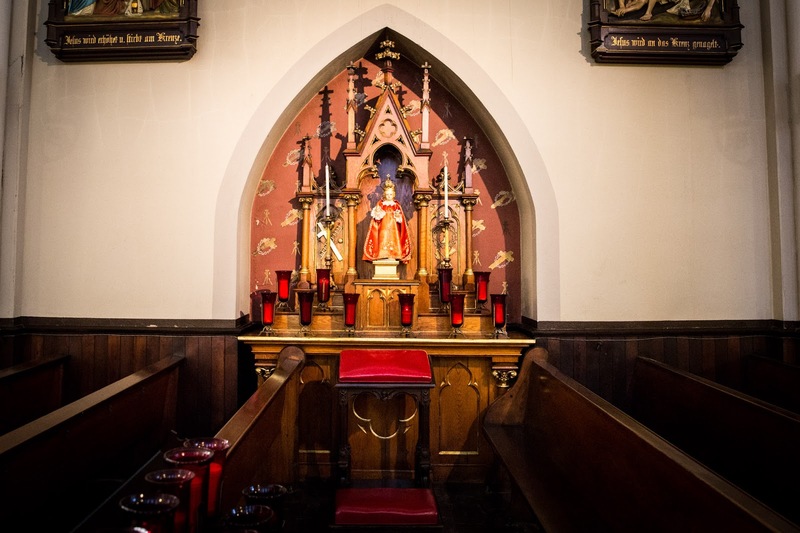 The weekly St. Joseph Oratory schedule, including two Sunday Masses, daily Mass and confession, Vespers and Benediction, and catechism classes for all ages, will be announced shortly. St. Joseph was founded in 1855 by German immigrants. 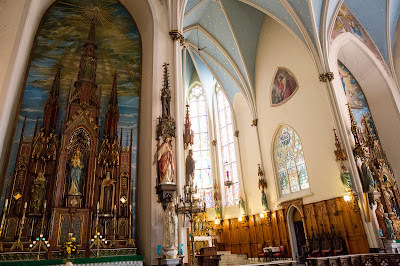 The present church, dedicated in 1873, was designed by German-American architect Franz Georg Himpler, whose works include, among others, Ss Peter and Paul in St. Louis (located a mile and a half from the Institute’s St. Francis de Sales Oratory) and St. Francis de Sales in Cincinnati. 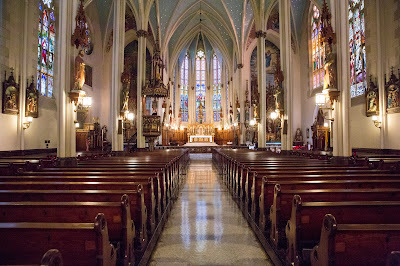 The exquisite interior of St. Joseph has remained virtually unchanged. 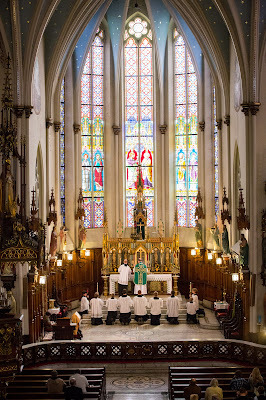 The church celebrated a Latin Novus Ordo Mass ad orientem on Sundays since the post-Conciliar liturgical changes; over the decades, the regular schedule also included English and German Masses. The Ordinary Form Masses were enriched by the spirituality of the Extraordinary Form, and beginning in 2007, EF Masses were celebrated on certain feast days, most notably Christmas Midnight Mass, and for a time even monthly on Sundays. 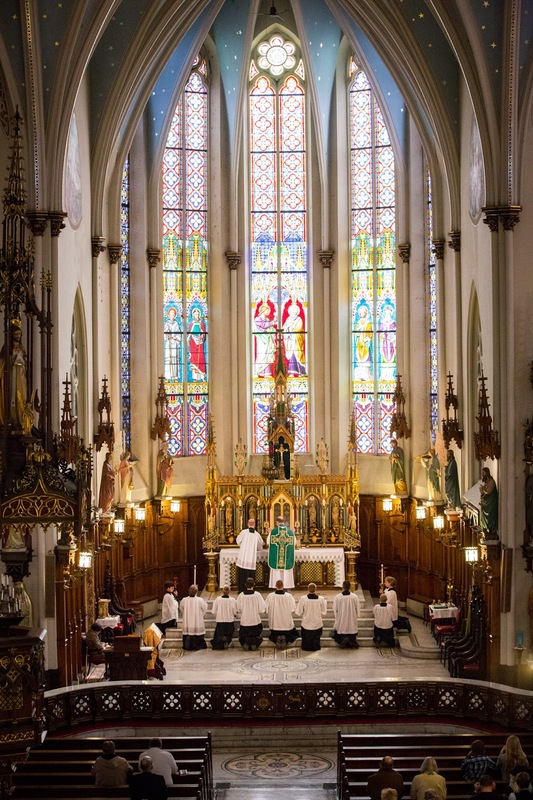 In recent years, the sole weekly Sunday Mass was the Latin Novus Ordo with polyphonic, orchestral, or chant Mass settings, polyphonic motets, Gregorian chant propers, and use of the Gregorian Missal as pew book. Traditional vestments, beautiful sacred vessels, incense, bells, altar server men and boys, and reception of Holy Communion at the altar rail were standard. Archbishop Vigneron’s invitation to the Institute is being hailed as a miracle for St. Joseph and an answer to prayer. 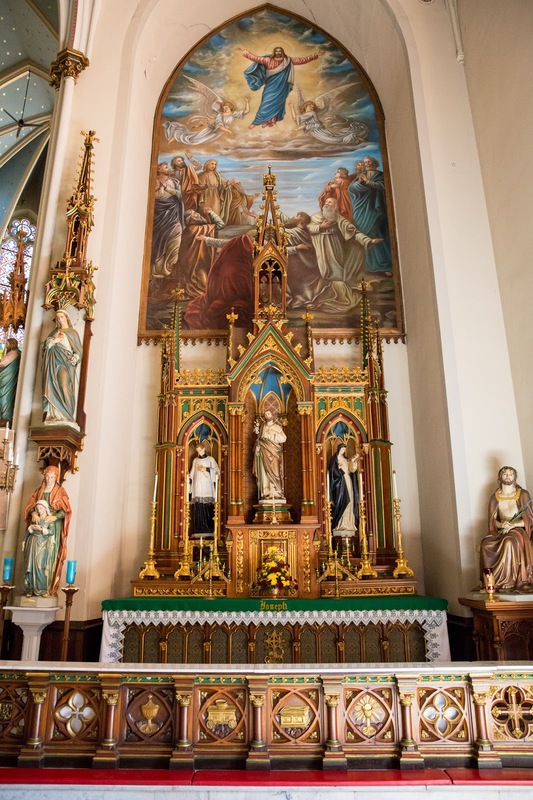 Parishioners look forward with hope to a full and vibrant parish life, continued and expanded devotions to St. Joseph, and a campaign to support critical restorations. 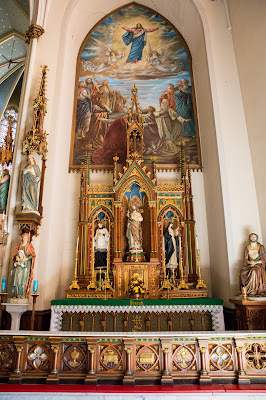 The community which has celebrated the Tridentine Mass every Sunday at St. Josaphat for the last twelve years is grateful now to have a parish where all the sacraments will regularly be celebrated according to the old rite. 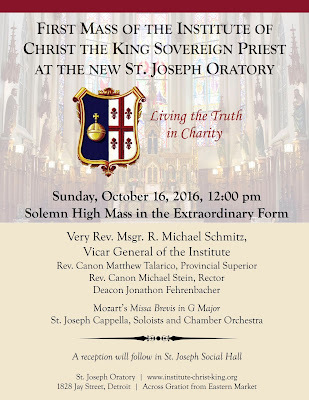 For the faithful of St. Joseph, it will be a fascinating spiritual journey to move from the weekly Latin Novus Ordo to the Traditional Latin Mass with the Institute of Christ the King.